Over the years, a lot of the projects that I’ve edited have been based on real-person interviews. This includes documentaries, commercials, and corporate video. As the cost of camera gear has come down and DSLRs became capable of delivering quality video, interview-based production now almost always utilizes multiple cameras. Directors will typically record these sections with two or more cameras at various tangents to the subject, which makes it easy to edit for content without visible jump-cuts (hopefully). In addition, if they also shoot in 4K for an HD delivery, then you have the additional ability to cleanly punch-in for even more framing options. While having a specific multicam feature in your NLE isn’t required for cutting these types of productions, it sure speeds up the process. Under the best of circumstances, you can play the sequence in real-time and cut between camera angles in the multicam viewer, much like a director calls camera switches in a live telecast. Since you are working within an NLE, you can also make these camera angle cuts at a slower or faster pace and, of course, trim the cuts for greater timing precision. Premiere Pro is my primary NLE these days and its multi-camera editing routines are a joy to use. Synchronization is the main requirement for productive multicam. That starts at the time of the original recording. You can either sync by common timecode, common audio, or a marked in-point. Ideally, your production crew should use a Lockit Sync Box to generate timecode and sync to all cameras and any external sound recorder. That will only work with professional products, not DSLRs. Lacking that, the next best thing is old school – a common slate with a clap-stick or even just your subject clapping hands at the start, while in view on all cameras. This will allow the editor to mark a common in-point. The last sync method is to match the common audio across all sources. Of course, that only works if the production crew has supplied quality audio to all cameras and external recorders. It has to be at least good enough so that the human editor and/or the audio analysis of the software can discern a match. Sometimes this method will suffer from a minor amount of delay – either, because of the inherent offset of the audio recording circuitry within the camera electronics – or, because an onboard camera mic was used and the distance to the subject results in a slight delay, compared to a lav mic on the subject. In addition to synchronization, you obviously need to record high-quality audio. This can be a mixer feed or direct mic input to one or all of the camera tracks, or to a separate external audio recorder. A typical set-up is to feed a lav and a boom mic signal to audio input channels 1 and 2 of the camera. 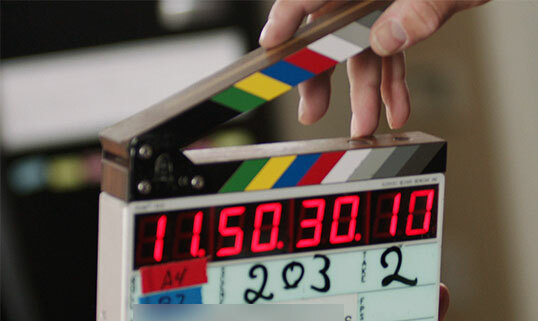 When a mixer and an external recorder are used, the sound recordist will often also record a mix. Another option, though not as desirable, is to record individual microphone signals onto different cameras. The reason this isn’t preferred, is that sometimes when these two sources are mixed in post (rather than only one source used at a time), audio phasing can occur. To synchronize multicam clips in Premiere Pro, simply select the matching sources in the browser/bin, right-click, and choose “Create New Multi-Camera Source Sequence”. You will be presented with several options for sync, based on timecode, audio, or marked points. You may also opt to have the clips moved to a “Processed Clips” bin. If synchronization is successful, you’ll then end up with a multicam source clip that you can now cut to a standard sequence. A multicam source clip is actually a modified, nested sequence. You can open the clip – same as a nested sequence – and make adjustments or apply filters to the clips within. You can also create multicam clips without going through the aforementioned process. For example, let’s say that none of the three sync methods exist. You have a freewheeling interview with two or more cameras, but only one has any audio. There’s no clap and no common timecode. In fact, if all the cameras were DSLRs, then every clip arbitrarily starts at 00:00:00:00. The way to tackle this is to edit these cameras to separate video tracks of a new sequence. Sync the video by slipping the clips’ positions on the tracks. Select those clips on the timeline and create a nest. Once the nest is created, this can then be turned into a multicam source clip, which enables you to work with the multicam viewer. One step I follow is to place the multicam source clip onto a sequence and replace the audio with the best original source. The standard multicam routine means that audio is also nested, which is something I dislike. 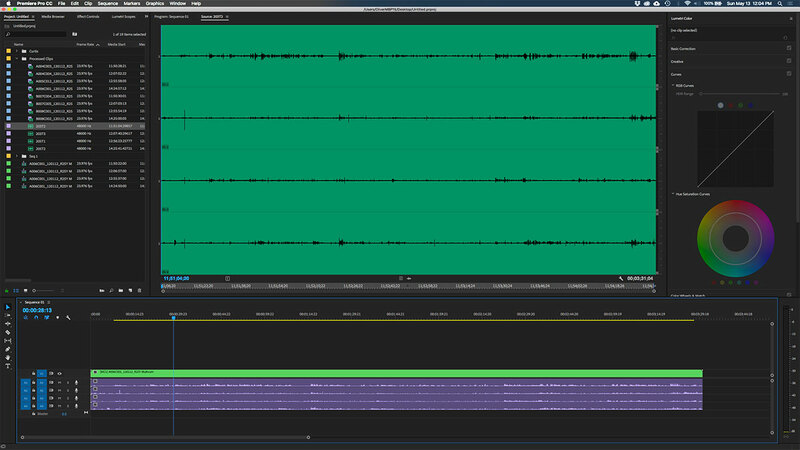 I don’t want all of the camera audio tracks there, even if they are muted. So I will typically match-frame the source until I get back to the original audio that I intend to use, and then overwrite the multicam clip’s audio with the original on this working timeline. On the other hand, if the manual multicam creation method is used, then I would only nest the video tracks, which automatically leaves me with the clean audio that I desire. One simple approach is to use an additional utility to create multicam sequences, such as Autosequence from software developer VideoToolShed. To use Autosequence, your clips must have matching timecode. First separate all of your clips into separate folders on your media hard drive – A-CAM, B-CAM, SOUND, and so on. Launch Autosequence and set the matching frame rate for your media. Then import each folder of clips separately. If you are using double-system sound you can choose whether or not to include the camera sound. Then generate an XML file. Now, import the XML file into Premiere Pro. This will import the source media into bins, along with a sequence of clips where each camera is on a separate track. If your clips are broken into consecutive recordings with stops and starts in-between, then each recorded set will appear further down on the same timeline. To turn this sequence into one with multicam clips, just follow my explanation for working with a manual process, described above. At this point, I dupe the sequence(s) and start a reductive process of shaping the interview. I usually don’t worry too much about changing camera angles, until I have the story fleshed out. When you are ready for that, right-click into the viewer, and change the display mode to multicam. As you play, cut between cameras in the viewer by clicking on the corresponding section of the viewer. The timeline will update to show these on-the-fly edits when you stop playback. Or you can simply “blade” the clip and then right-click that portion of the clip to select the camera to be shown. Remember than any effects or color corrections you apply in the timeline are applicable to that visible angle, but do not follow it. So, if you change your mind and switch to a different angle, the effects and corrections do not change with it. Therefore, adjustments will be required to the effect or correction for that new camera angle. Once I’m happy with the cutting, I will then go through and make a color correction pass. If the lighting has stayed consistent, I can usually grade each angle for one clip only and then copy that correction and paste it to each instance of that same angle on the timeline. Then repeat the procedure for the other camera angles. When I’m ready to deliver the final product, I will dupe the sequence and clean it up. This means flattening all multicam clips, cleaning up unused clips on my timeline, deleting empty tracks, and usually, collapsing the clips down to the fewest number of tracks. This entry was posted in apps-gear-filters, editing, Premiere Pro, tips and tricks, workflows and tagged editing, Premiere Pro, workflows.